Robert Wenzel: Will Trump's Tariff Policies Accelerate The Robotics Industry? 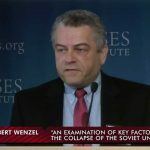 - Wall St. for Main St.Wall St. for Main St.
Robert Wenzel: Will Trump’s Tariff Policies Accelerate The Robotics Industry? Wall St for Main St welcomed back Robert Wenzel. He is the editor of the Economic Policy Journal and host of The Robert Wenzel Show. 1. We discussed the Dow Jones going over 20,000 last week and what it means for the market. Is there sense of optimism or should we be cautious? 2. A look at Trump’s tax import (tariff) policies and who is the biggest loser in this deal. 4. How minimum wage has impacted the west coast a few years after it was implemented.